If you have ever lost a key, or broken a key somehow in the past, then you know how important it is to duplicate a key. Several keys, in fact. You can never be too sure, so the more duplicate keys you make, the more secure you will be. As far as duplicating a key, if you have the blank key itself, Key Man Service Santa Clarita can cut it for you. We can create all types of duplicate keys such as high security keys, regular keys for elevators, mailbox keys, office keys, and much more. 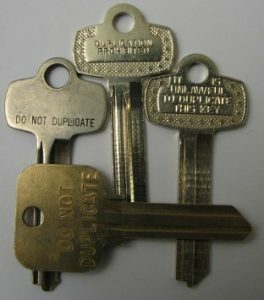 Can you make a copy of a key that says, ‘Do Not Duplicate’?”. Also known as a “DND” key, the answer is yes. Every key is able to be duplicated. 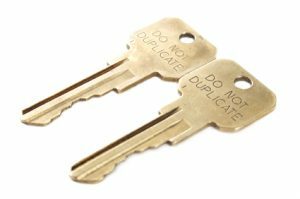 For a key that says, “Do Not Duplicate”, we are able to duplicate it as long as the owner of the key gives authorization to copy it. These are keys that are usually for companies or businesses. Whether it’s for their business gate, their office, their elevator, or their bathroom, it belongs to them. No one else can get a hold of it. Can you make a copy of a copied key? Yes, you can make a copy of a copy, but it’s not going to be the same as having the copy from an original. It really depends on how the key is cut, but every time you copy it, the duplicate will have more and more errors until it just won’t work on the lock anymore. How much is it to make a copy of my key? Regarding a key that is NOT for a vehicle, it depends on what kind of key it is, but it varies from $5 to $20. That is, if you’re going to a locksmith that has a store. For the ones that are mobile service, however, you’re looking at around the same price, plus a service fee for the locksmith technician going out to your location. In addition, our service fees vary from location to location. For car keys, our prices also vary by year, make, and model. We can make metal car keys, keyless car keys, or keys with a remote. For metal keys, it’s important to note that they are double-sided keys. Meaning that the key can unlock & start the vehicle no matter which way you insert it. Regular keys can vary from $150 to $450. Again, it depends on the vehicle. You can’t compare a Honda to a Porsche. Lastly, keyless car keys vary from $250-$600. We also guarantee key duplicates for your home, car, or business! So, when you need of a copy of a key, any key, don’t hesitate to give us a call today. Key Man Service is open 24 hours a day, 7 days a week, so contact us today at (661) 210-1182.